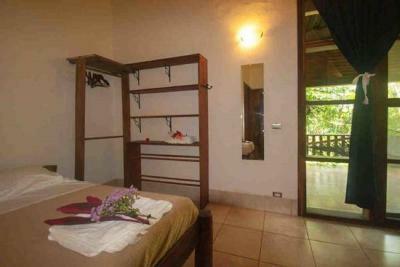 Lock in a great price for Totoco Eco-lodge – rated 8.3 by recent guests! Amazing views, delicious food for dinner and breakfast. Couldn't have asked for a better stay. What a beautiful resort! You cannot beat the view from this property - both at the restaurant and in our Lodge. 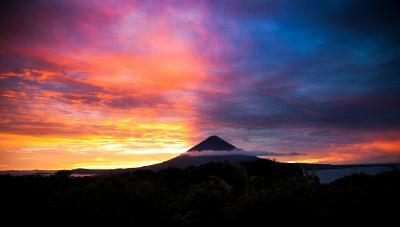 We had a stunning volcanic view from our porch and also a beautiful view from the resorts restaurant and pool. You really feel one with nature at this resort. The breakfast was great and I really love all that the resort does for the community and environment. The staff was friendly, knowledgeable and helpful. The kitchen and bar staff are the sweetest people and go out of their way to assist you. The administrator facilitated tours and transportation for us. Totoco staff were super friendly and always there to help. They helped us several times for modifying our ferry reservation (we had to reserve a spot for our car), booked our tour guide for the volcano hike and in general everything we asked for was provided immidiately with no hustle, which gave us peace of mind to just relax and enjoy this beautiful island. Our house was beautiful and super clean and surprisingly bug-free, given the fact that you are literally in the middle of a tropical forest! 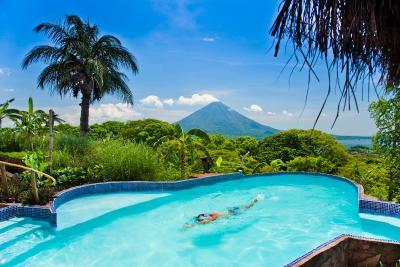 The pool is gorgeaous and allows you to enjoy the view of Madera volcano while you enjoy your drink and relax after an adventurous day on the island :-) Totoco is an eco-friendly lodging facility with a meaningful mission to foster sustainable tourisim and community involvement, which makes it an even more attractive place to stay. I highly recommend! Gets you in-tune with nature. I would not change a thing. From the top to the bottom everything was perfect. From the fresh farm raised food to the made from scratch Margaritas along with the sounds of the creatures in the woods. This place is the Bomb , Two Thumbs Up !! One of our best sellers in Balgue! 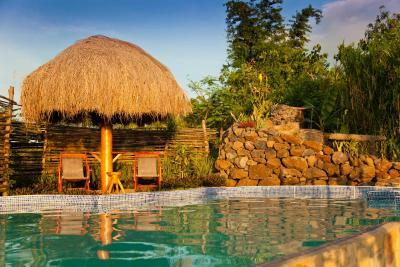 Offering an outdoor swimming pool and a restaurant, Totoco Eco-lodge is located in Balgue. Free Wi-Fi access is available in public areas of this lodge. 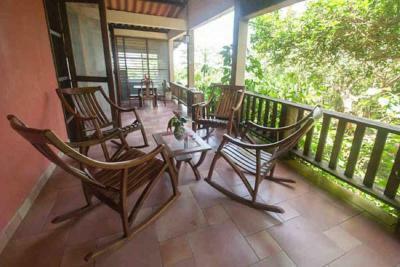 The bungalows offer wooden furniture, mosquito net and a fan. Private bathrooms come with a shower. 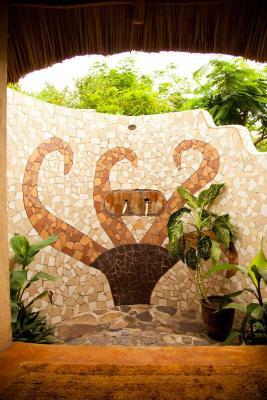 The property is an Eco-lodge in the middle of the tropical forest, uses only solar energy and have dry pit latrines. Guests can enjoy international dishes and local food at the on-site restaurant. 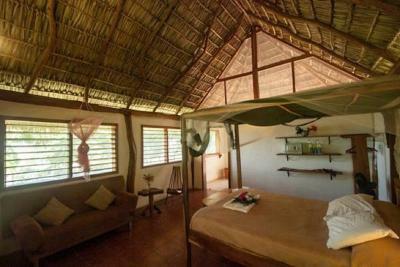 At Totoco Eco-lodge you will find a terrace with hammocks and free parking. 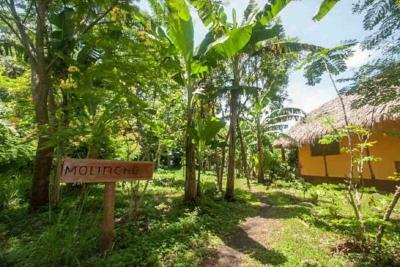 This property is 1.2 mi from Maderas Volcano and 0.7 mi from Nicaragua Lake. Playa Santo Domingo Beach is 4.5 mi away and Puerto de Gracia is 12 mi away. 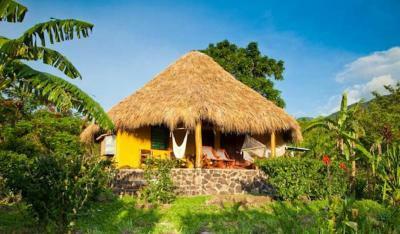 When would you like to stay at Totoco Eco-lodge? 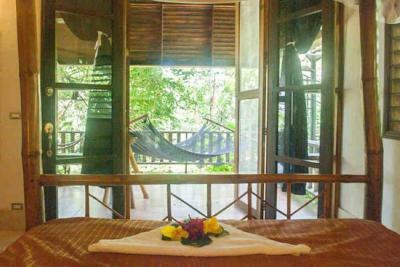 This private lodge includes a custom-made bed and a private bathroom with a warm water shower. 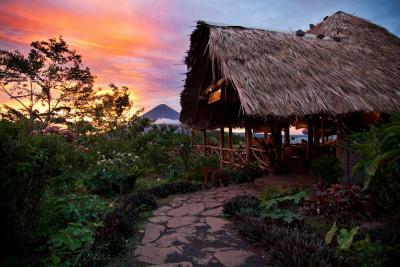 A porch with a hammock and seating area set in a tropical garden setting and great views of Concepcion Volcano and lake Nicaragua. The lodge sleeps a maximum of 2 people. 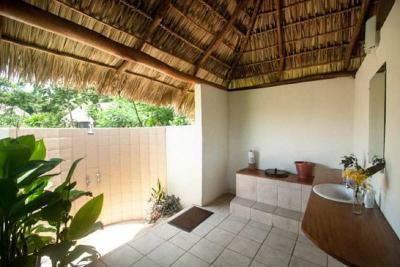 This private lodge includes a custom-made bed and a private bathroom with a warm water shower. A porch with a hammock and seating area set in a tropical garden setting and great views of Concepcion Volcano and lake Nicaragua. The lodge sleeps a maximum of 2 people. An extra bed for a 3rd person can be added to this lodge for an additional cost. 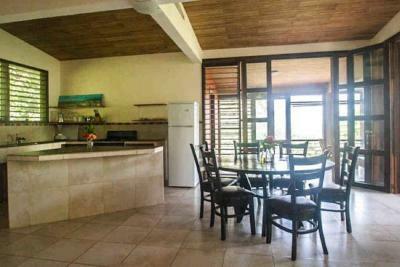 This spacious holiday home has two bedrooms and a fully equipped kitchen & dining area. A spacious porch and a roof terrace includes a plunge pool are enjoyed. Views of the lake and Concepcion volcano from the terrace and lounge are available. The bathroom is located off of the lounge. The house sleeps up to 4 people, and 2 more people may be added for and addition cost each. This lodge offers two rooms. The first room has a sofa and a custom-made bunk-bed with a twin on the bottom and a single on top. The bathroom with warm water shower is located off of this room. The master bedroom has a 4-poster king size bed. 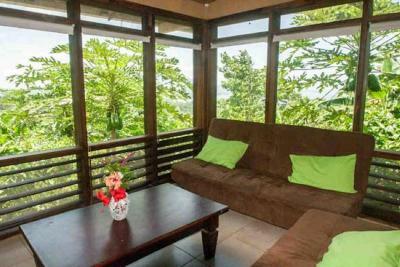 The private porch offers a tropical garden setting and views of Concepcion Volcano. The lodge sleeps up to 4 people, and 1 more person may be added for and addition cost each. 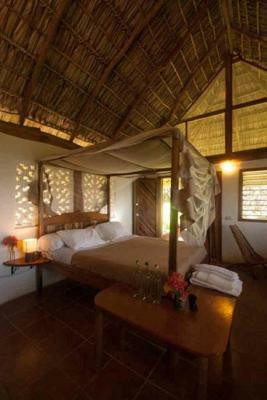 House Rules Totoco Eco-lodge takes special requests – add in the next step! 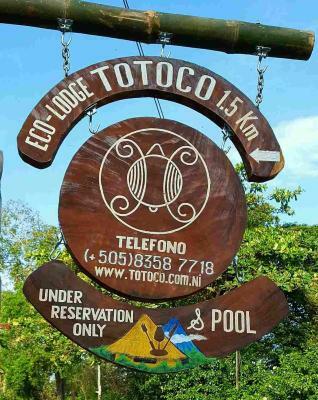 Totoco Eco-lodge accepts these cards and reserves the right to temporarily hold an amount prior to arrival. Food available in evening was good but limited. Nothing to complain about. 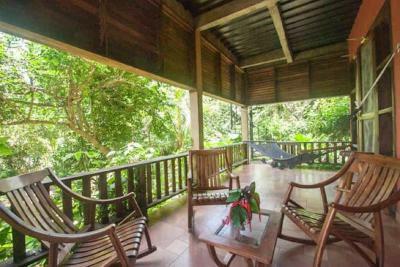 My intentions were to go an Eco Lodge, wake up to the monkeys roaring and hundreds of birds chirping. We got what we wanted and more. The walk uphill from the main road! The view is amazing, and the room was top quality. The staff was nice to talk with, and gave honest advice about activities/rentals instead of just focusing on selling. (Eg. dry season meant less interesting waterfall, and all those accidents due to rental of scooters and ATV’s) This was the best accomadation for a long time. The view was truly amazing! And the nature surrounding was so colorful. Truly horrifc road leading in, restaurant was closed (delivery arranged however) lost power periodically, (and one whole night) hot water sporadic (mostly cold showers). Didn’t refresh composting toilet - stinky. Views amazing, night sky lovely. King bed and large bunk beds. Lovely chill feel to common area, especially at night. Great night sounds. Staff pleasant and trying to keep things going through downturn. I loved the location off the beaten trail, into the forest of the volcano. I loved my bungalow which was very large with a huge 4-poster king bed that I tried to touch all of it. The mattress was very comfortable and the winds coming down from the volcano sent me into a blissful sleep. I received two bottles of filtered water each day and the room was decorated with plants and flors from the property. I loved it! Pablo, Ericra, and others are now my family. They treated me as an Abuela Reina and I love them for that. I stayed at the property the entire time since it was a relaxing and rejuvenating stay. Speaking of rejuvenating, Yolanda, the masseuse, has healing hands, don't leave without a massage. The breakfast was SO GOOD!!! I ordered #4 EVERY morning. I didn't need to eat for the rest of the day because I was full from just being in this magical place on earth! The views were breathtaking and I enjoyed walking around the many plants and floras and picking bush for my tea in the morning. 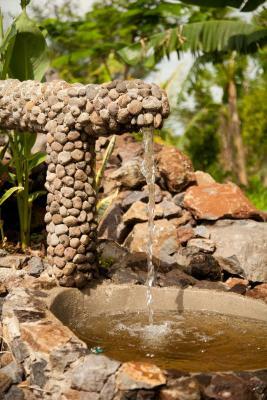 The eco-design of the property made me feel one with nature and I took steps not to leave my footprint behind. Next time, an outdoor shower. Shout out to Miguel too! Stay focused Miguel and all of your dreams will come true. I believe in you!! I will definitely come back again soon with my peeps who can appreciate the labor of love at Totoco EcoLodge. Gracias Todos! It was a shame that the restaurant was closed the whole time, as the rural location means it’s very difficult to get anywhere because of the poor road up to the hotel. We were however able to order food from nearby restaurants and have it delivered. It sounds like the restaurant will reopen soon though. We had such a great time here at Totoco. The rooms were lovely, clean and comfortable - the best nights sleep I’ve had so far. The breakfast was great - they even had soya milk! The staff were so helpful and friendly and helped to make our stay great. I think this hotel probably has the BEST view on the island!! Perfect for sunset drinks. What an amazing place to stay. Pablo was a terrific host who went the extra mile to make our stay that much more special. If you stay anywhere else on the island you're missing out on a very unique experience with amazing views. I can't recommend this place enough. Thanks again for everything Pablo!!!!! Nice view . Clean . Spacious room . very comfortable bed . We were a bit "spooked out" because the staff informed us of people who had come to the site to rob some of the casitas. They told us to lock everything up as soon as we get in the house. The kids were afraid most of the night. There were lots of cameras inside and outside the house. I do not think of Omotepe as a scary place so I am not sure if what they were telling us was just a rare incident that surprised them. Totoco was our first stop on our Nicaraguan trip. We were hesitant to go at first due to the travel warning that Canada and USA had issued. 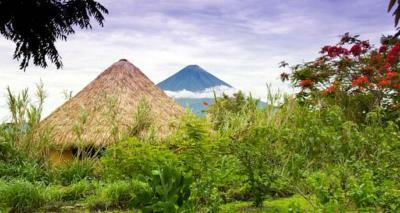 WE ARE SO GLAD to have decided to go regardless and we felt safe at all time.The touristic destinations such as isla de ometepe are more than safe. We discovered an island with breathtaking landscapes like we have never seen before. Totoco has the nicest views on the volcano and the area and we felt almost alone on this privileged environment. Pablo was extremely accommodating to us and did everything to make our stay as enjoyable as possible. He set us up with the best guide for our hike on Concepcion volcano which to this day will remain one of our most memorable experience. One thing to know before booking Totoca you need to rent a 4 x 4 as the road to get up there is quite bumpy. 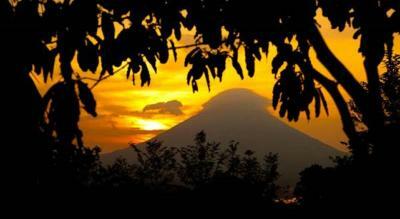 For most of Nicaragua it’s preferable to rent an suv if you want to be free to explore anyways. Terrible location. Looks good on Google but it's up a road in very poor condition; almost impossible to maneuver a scooter. Compost toilets. Breakfasts were amazing. Staff were friendly and helpful.